New on the site this month: Fender/Chroma Music System outlines features of the ground-breaking Apple II software for the Chroma and Polaris. Thanks to David Clarke [21030085++] for this information. I bought a brand new Apple IIe just to run this software. The Apple was a step back from (and considerably more expensive than) my then state-of-the-art Atari 800. I even used it live a few times. Here's a pic. The only saving grace about carrying all that stuff was that I was not doing one nighters at that time. We were moving approx every two weeks. We did also carry a big 3 way JBL PA, and extensive lighting including fresnels, ellipsoids, and a follow spot. It was a very successful 60's band in Cincinnati called Runner. This would have been about 1983-1984. 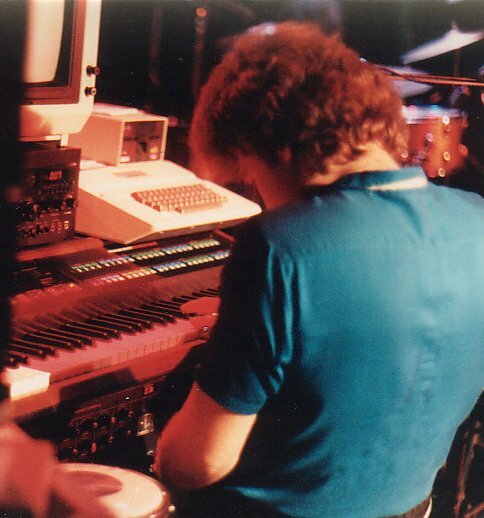 When I used the Apple onstage for special occasions, I would bring a friend's extra Chroma and sequence the orchestral ending to "Knights in White Satin". The cassette deck you might see in the picture was used for playing the final gong sound, and the little round pad to the left was a Synare digital tympani which I played live during the sequence. I have a live tape of the performance laying around somewhere. I should dig it up and see if it sounds better or worse than my memory of it. LOL! i've been using my chroma w/cc+ for a while happily, but today i wanted to test sibelius 4 and have an issue. i use an m-audio usb/midi hub btw which the cc+ is plugged into, on midi ch1. midi output is being recorded in sibelius ok, but input back to the chroma (so i can hear the analog synth being triggered) isn't working. in sibelius there's a Playback devices setup and a midi test feature, which when I select on chroma channel, i see the LEDs blink (from PC->m-audio->cc+ -> chroma), but no audio comes out the chroma. actually now i test it once the test runs (verified through cc+ LEDs blinking), the chroma doesn't make any sound until i change programs. anyone have an idea what this could be? I was thinking maybe of capturing the midi communication Sibelius is sending also, does anyone know a free midi sniffer program? If you are using a PC, MIDIOX is a great freeware MIDI utility. Perhaps Sibelius is sending a rogue MIDI volume change to the Chroma? Can you use some other software to verify your MIDI is being received? I was wondering how many spaces are left to fill the next CC+ order? We already have some orders for the CC+ batch #4 but we need at least other 6 to start a new batch; so I would encourage all the "would be" users to contact David and me (David is out of reach until the 15th) as soon as possible. Hi Luca, any news about this? we're quite ready with kits, just I'm awaiting for the final pricing of metalwork and shipping quotation. Then I'll post the definitive kit prices and shipping conditions, different between European and USA destinations. All interested customers will be invited to pay the kit in advance, thus allowing large items quantities purchase, to obtain a good quote for them. After that, a first batch of 30 kits will be set up and shipped. The father of the Chroma, Phil Dodds, has left us. Sad news. While I never met him in person, I had the pleasure of "interviewing" him a few years back [see Philip Dodds/Tony Williams Interview]. His enthusiasm and love, twenty years on, for one of his projects, and especially the people involved, really struck me. If it weren't for Phil Dodds, the Chroma would never have made it to production. He rescued the project from the bankrupt ARP and re-started it at CBS/Fender [see The Synth That Survived ARP's Fall]. "The father of the Chroma, Phil Dodds, has left us." This is very sad news, thanks for letting us know, Dave. Only this evening, my daughter was asking me if she could use my Chroma for her music homework, because she finds the keyboard that Phil designed so nice to play. He touched many lives, and he had the face of a good man, as seen in his appearance in "Close Encounters Of The Third Kind". I saw the movie as a child, and, years later, I thought it really cool that the designer of my favourite instrument turned out to have been the nice guy that played music to the Mothership. Rest in peace, Phil, thanks for everything. His one line in "Close Encounters" was "What are we saying to each other?" It speaks volumes and volumes, and in all contexts. God rest you, Philip Dodds. ...on Friday, there'll be a lot of analog(ue) synth action - I'm taking out the Wiard box, my Chroma and a Korg Lambda, I think there's going to be a guy with a Prophet 5? Another guy is def. bringing a bohm modular and a micromoog, it's going to be a blast, I think. There'll be 9 different performers, playing on a rota. It would be nice to see some AHers there? Will the JL [Cooper] Chromaface midi box run off the power coming from the Chroma computer interface port without needing to use an external 9V wallwart? It can, depending on what's been done with the box. In the normal configuration, the external 9V supply powers an internal 5V regulator (7805) and the 5V power from the Chroma interface is a 'no connect'. A modification is possible whereby the connection to the regulator is cut, and the 5V line from the Chroma is wired to directly power the Chromaface. I got both my Chroma Expanders back from service today. Serial number is 16310010 (the other doesn't have a serial number) Roy Paynter serviced both of them, he is a trained Chroma tech in the UK. I am selling one unit and keeping the other. The unit i'm selling is in pretty good shape the front panel is nice and clean. It comes with a JL cooper midi interface and the user manual. While i've tested the unit i'm keeping (it has CC+ midi installed, so i could hook it up over midi) i've not been able to pass any audio on this Chroma i'm selling- as like i mentioned before, i haven't been able to get the JL Cooper interface working. This Chroma lefts Roy's workshop yesterday with a full bill of health, so i've no doubt it works perfectly, indeed i've powered it up and it's booted up with no error messages, all the front panel buttons work fine etc, but i'm just making the point that i've not been able to pass audio due to not being able to get the JL kit to work... This unit is sold with a 90 day warranty from Roy, running till end of January 2008. Roy is listed in the service centers on this site. Simply selling as like i mentioned i have two Expanders and always planned to keep one and sell the other. I'm not sure exactly what these units are worth, Jupiter 8/ Oberheim and Prophets regularly sell these days for over £2000 on Ebay UK, Chroma Expanders are really rare and sought after and this unit has just been serviced, so i'm looking to sell for £1750. Item #110183708284. "Buy It Now" price of £1950.00. This is Rob Belcher's unit he posted about on October 20 (serial number unknown). "This unit has just been fully serviced (October 2007) and been given a full bill of health by Roy Paynter, an Arp trained Chroma repair expert in the UK. As well as being serviced the internal PSU has been also replaced with a modern switching unit improving long term reliability and also makes the instrument a lot lighter!" I see it has had a fan installed. That worries me a bit. I wonder why someone thought that was necessary, especially given the power supply was replaced with a switcher. Yes, its my Chroma expander. The fan was installed by the last owner- before the PSU was changed by Roy. I actually have two Expanders, mine has a CC+ installed and this one (on Ebay) has a JL cooper interface. Btw, the fan has been disconnected- so there is no noise. Its actually in pretty nice shape and has just been fully serviced. I will knock £100 off the ebay price if anyone on the list wants it.. Might be open to trades too, try me! Fully serviced Chroma expander with JL cooper midi and manual. Rob told me in 2012 that this unit was sold. Not the best rep around the seller AFAI can remember though... 750 GBP. Description said in part, "Not working, good project for someone, all parts there (I think)." Contacted the seller for serial number information; no response. It's about 3:35 into the video. Cool box! I bet all the techs here would want one... But it hurts me to see rare istruments standing on the endcheeks like that. I've asked him if he has any plans or schematics. ... coming soon to a Rhodes Chroma site near you. See Voice Board Test Controller. Anyone know the answer to this question from Analogue Heaven? The parts list doesn't seem to help — or maybe it's just that I don't know my electronics components. Hello everyone! I have a tech working to bring my Memorymoog back to life. (I was swindled via eBay) I am in need of the LED display, part number LT 1604. If you know where I can find a replacement, please let me know! Is it possible that a Fender Chroma has the same part? I still ship my bits for sale to Canada and Europe, but one day I am sure I will get ripped off. All the buyer has to do is claim they never received the items, and reverse the charges. Impossible for me to prove, since none of the carriers offer delivery confirmation services for international shipping. The only thing I can do is try to mitigate my risk by only offering items for sale on my regular internet lists, but any community can have a bad apple. I completely agree - basically it is the same risk shipping from US to Europe or vice versa (too much fraud). Ebay might be ok for cheap items, but far too risky for expensive ones. I prefer to rely on direct contacts. And, one can be ripped off/defrauded just as easily with a state to state, city to city ebay transaction (within your own country) as could happen internationally. I don't really believe thats totally true. In the US you can take some precautions like delivery confirmation, tracking with signature verification etc. Everytime I've sent something to Europe I have to trust that they will be honest since I can't track that far (without paying A LOT extra). Usually if they say they never got something, I have no way of proving otherwise. I've had this happen to me as well. I called the local police who promptly intervened and I got a full recovery of my gear. I doubt I would get the same response calling another country as the internationality of it removes the case from local jurisdiction. If you are buying something expensive from anyone, this personcould be american, canadian, chinese, french, italian english or from any place on the planet (even from a neighbore) There is now way you can be shure of anything. PS:I have sold my Yamaha CS-80 a few years ago to a fellow in Norway, every thing went smooth. then again I'm canadian ha! ha! ha!